So as the Written in Soap project nears its ends, just how well did the statue made from soap stand up to one of our most bitter winters on records? 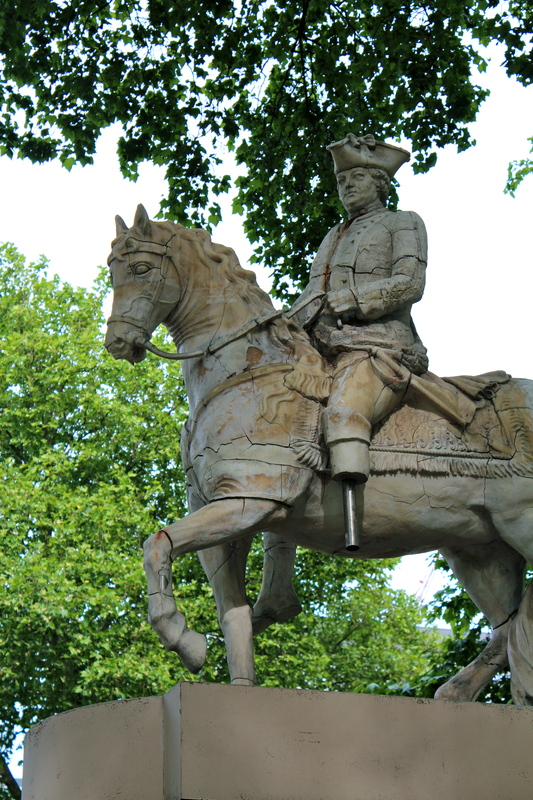 But just to recap slightly, artist Meekyoung Shin created a statue made of soap (with a metal armature) of the controversial Duke of Cumberland in Cavendish Square. The idea was to see how it would fare over the four seasons. Erected in July 2012, I first visited in August and by my second update in November not much had changed really, bar a bit of cracking. Almost twelve months on – and a lot of snow and rain later – it is a bit of a different story. 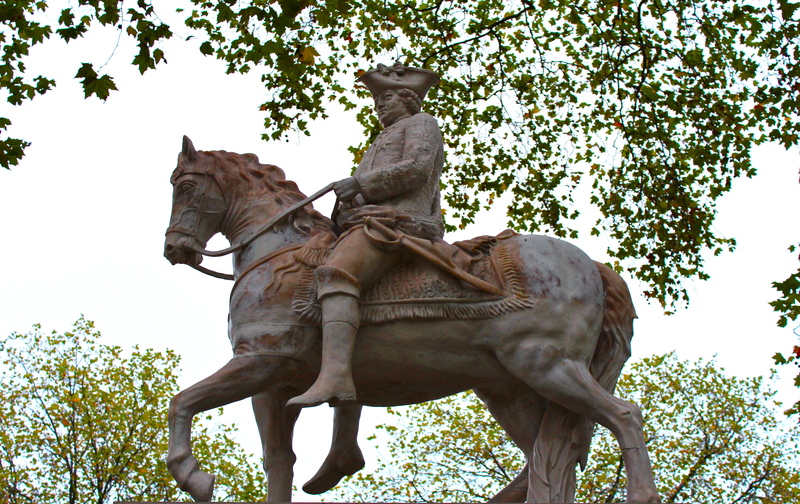 The Duke has now lost his left leg below the knee, exposing a metal rod. 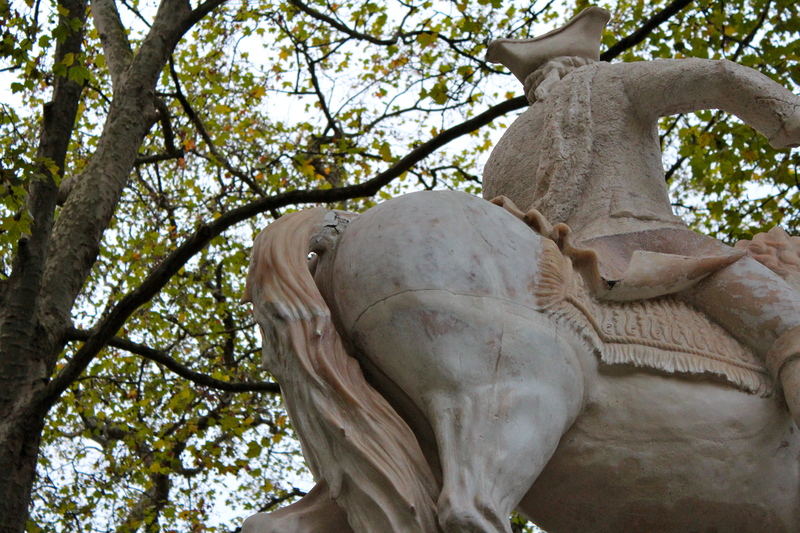 Nearby, the horse on which he sits is losing some of the ‘skin’ on its left foreleg, exposing yet more metal. 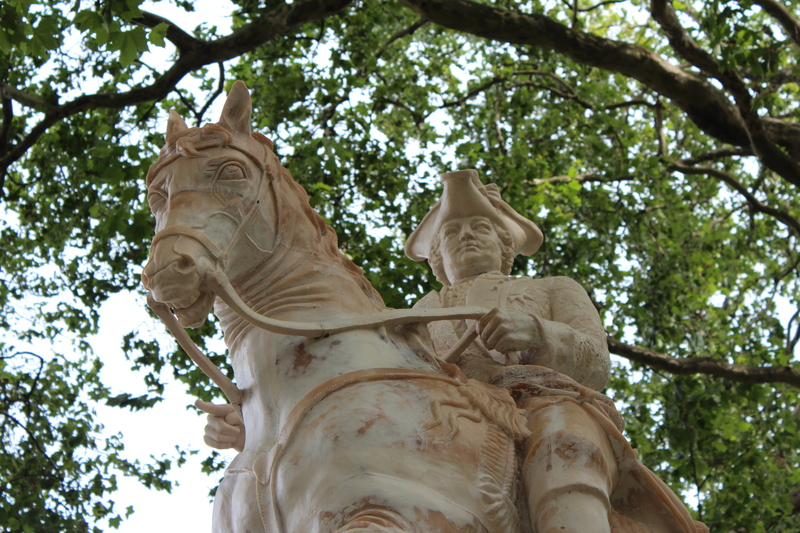 Overall though, I’d say the statue has weathered the storms remarkably well. 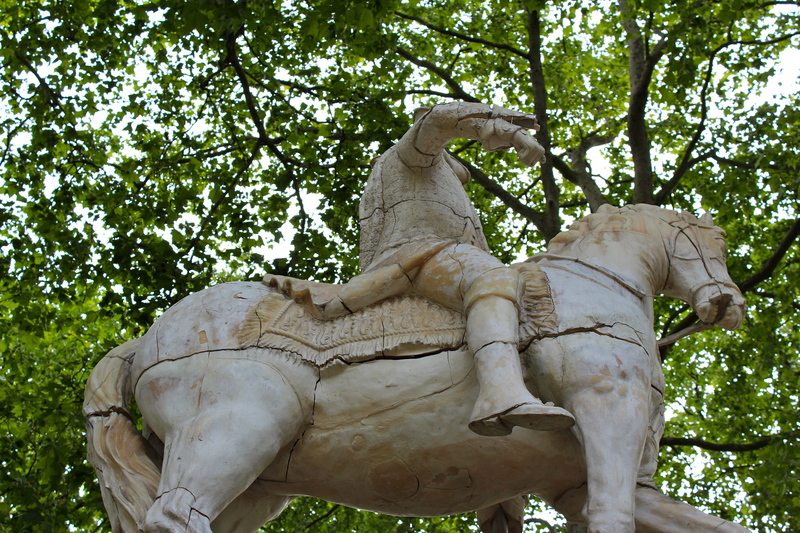 If you’d like to see it for yourself it will be in position in Cavendish Square until the 30th of June. Given that it’s now over three months (yes, a quarter of a year, where did it go?) 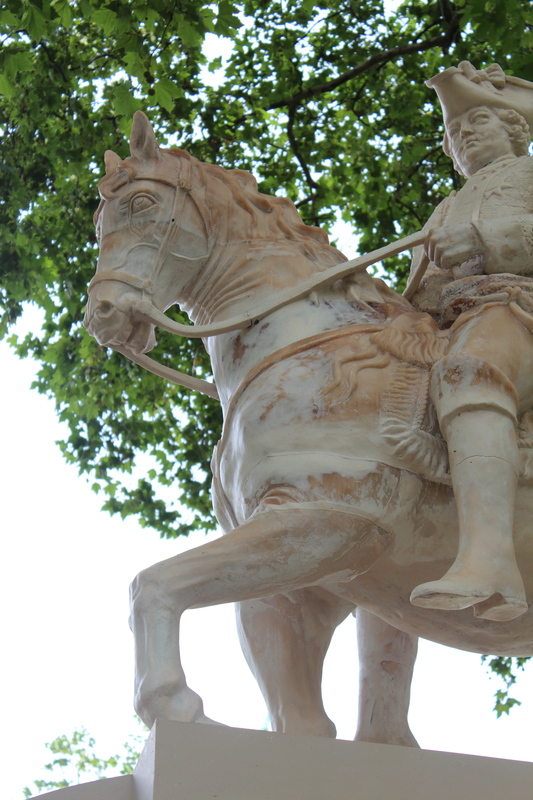 – and we’ve had some pretty inclement weather in that time – I thought it was high time I made good on my promise to keep you updated on the progress of the soap statue in Cavendish Square. 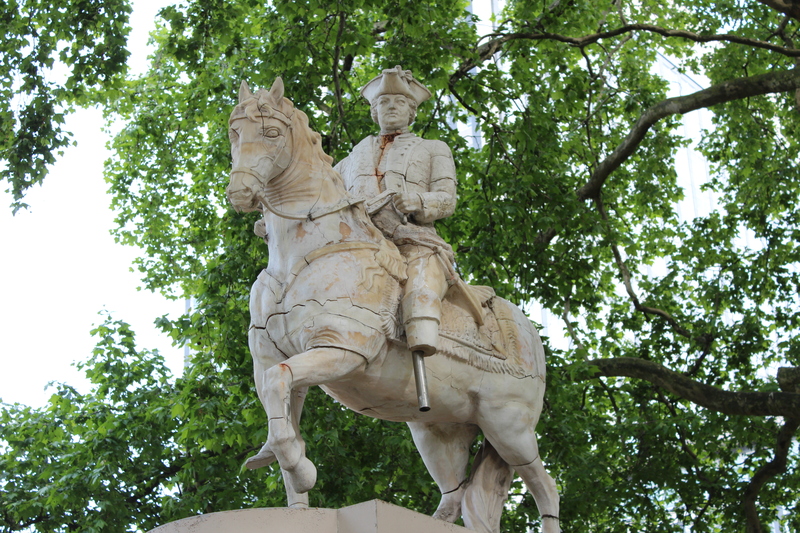 To briefly recap, artist Meekyoung Shin created a statue made from soap of the rather unpopular Duke of Cumberland – to fill the plinth that has stood empty in the square since the original was removed in 1868. Shin’s piece was unveiled back in July and will be on display until 30 June 2013, weathering whatever nature throws at in in the meantime. 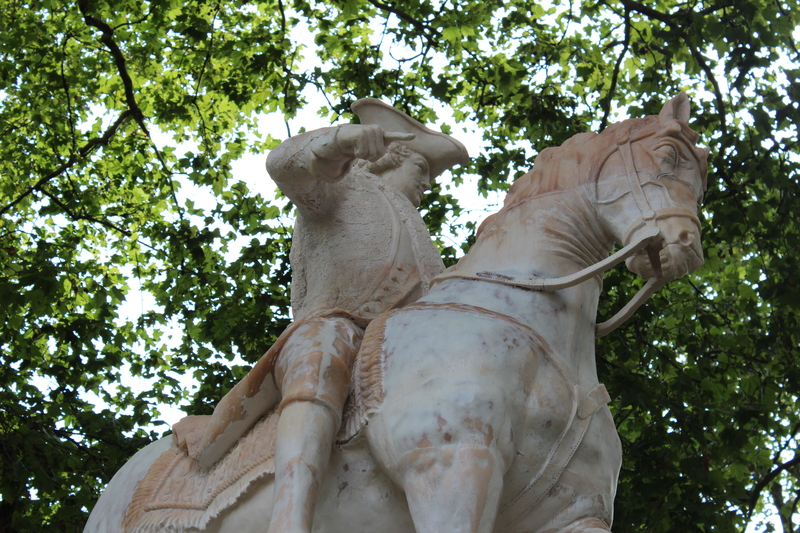 You can probably imagine my surprise when on approaching the statue there at first appeared to be no change at all. A closer inspection, however, revealed some extra cracking along the hind and one of the hind legs – some cracking was already present when I visited in August. Part of the soap is breaking up around the top of the tail – probably the most obvious new sign of decay – and there are a couple of darker marks elsewhere that might be parts of the underlying metal base showing through. But all in all horse and rider are in excellent condition considering. The mottling of the colour was already present on my first visit and is probably due to the nature of the soap itself. The major difference to report is that a sign has since been placed next to the statue, explaining the project. 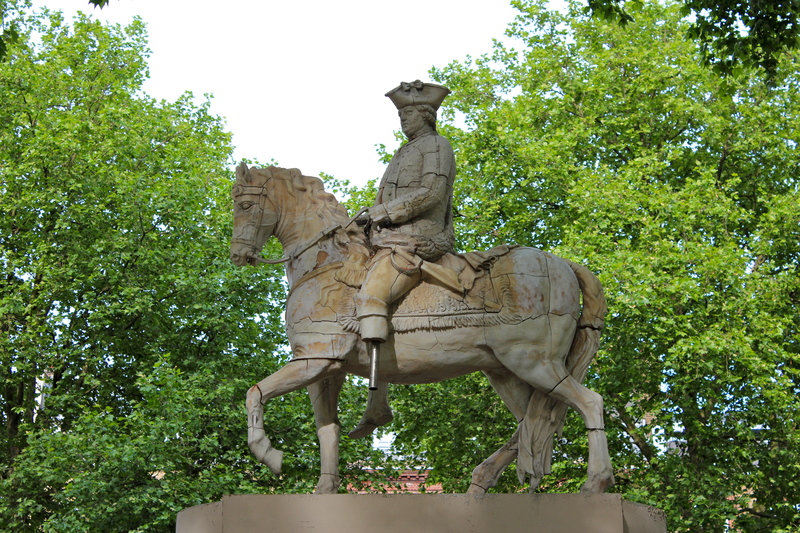 This actually constitues a significant improvement, as due to its realistic appearance many visitors to the square seemed unaware of the unusual nature of the statue in their midst. You can view my original post about Written in Soap here. 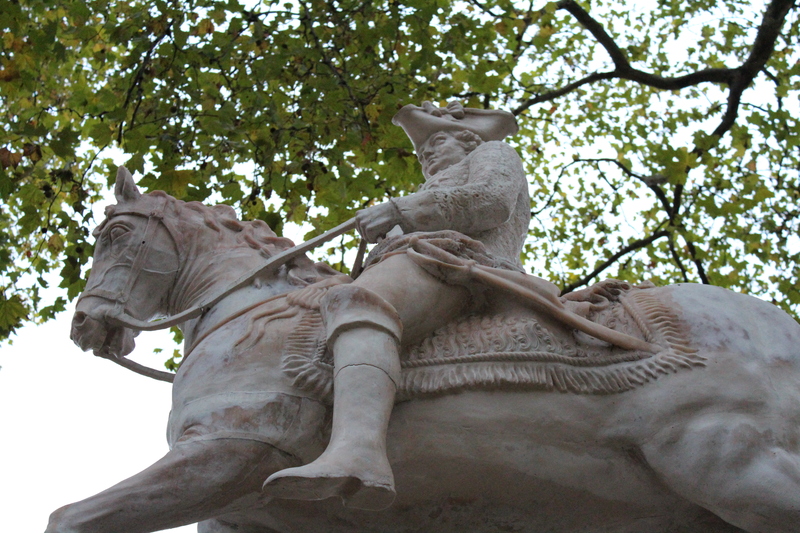 When Londonist wrote about the soap sculpture in Cavendish Square last week I knew this was something I had to see for myself. 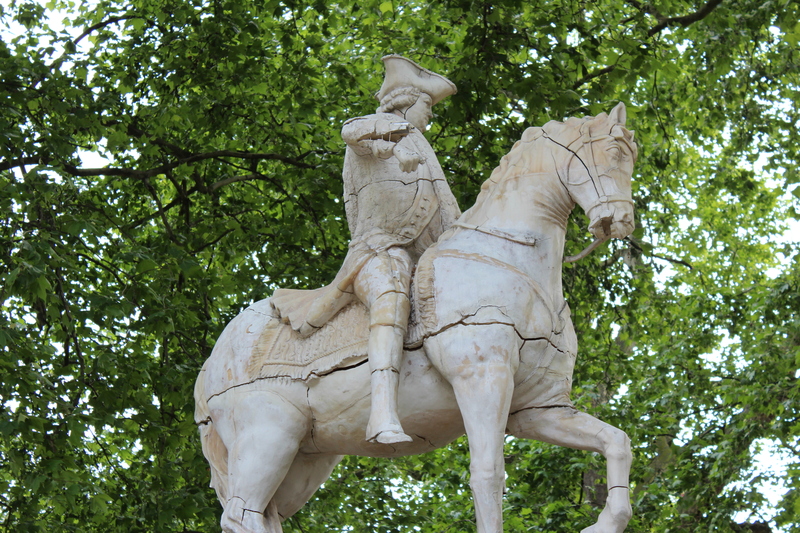 Much like the structure featured in last week’s post, Paleys upon Pilers, Meekyoung Shin’s soap sculpture is a temporary addition to London’s streetscape, which is part art installation, part historical reference. 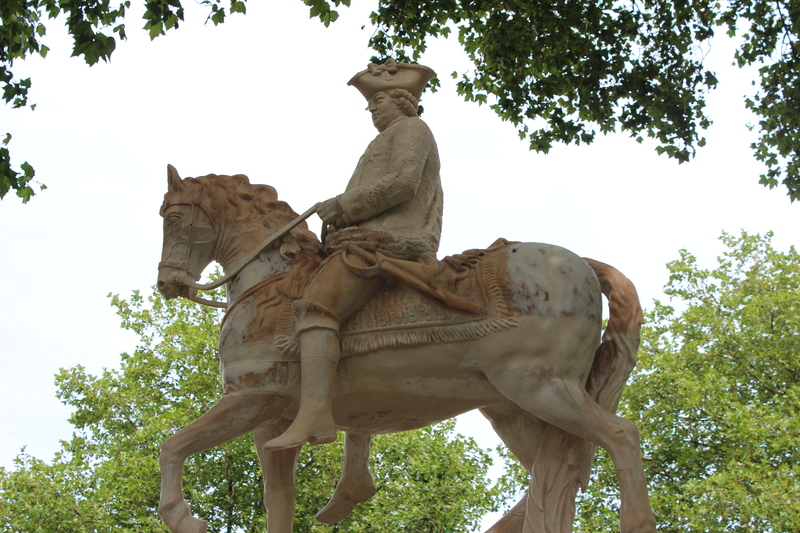 This soap scultpure of the Duke of Cumberland, which launched on 24 July, replaces the one originally installed in 1770 then removed in 1868 when the subject became increasingly unpopular. 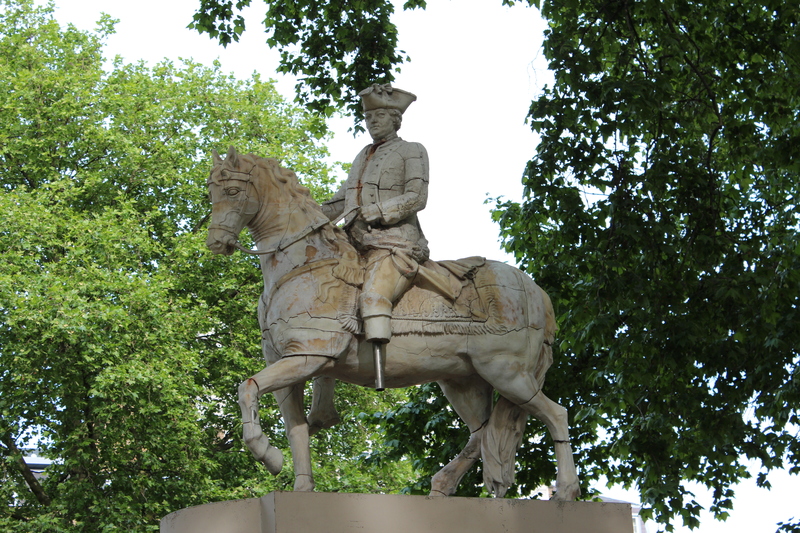 While the fate of the original statue is unknown, the stone plinth has stood empty ever since in the middle of Cavendish Square, just behind Oxford Circus. While Shin’s work is indeed made of (vegetable-based) soaps it does include a metal skeletal armature attached to the base on which it stands to hold the sculpture upright. 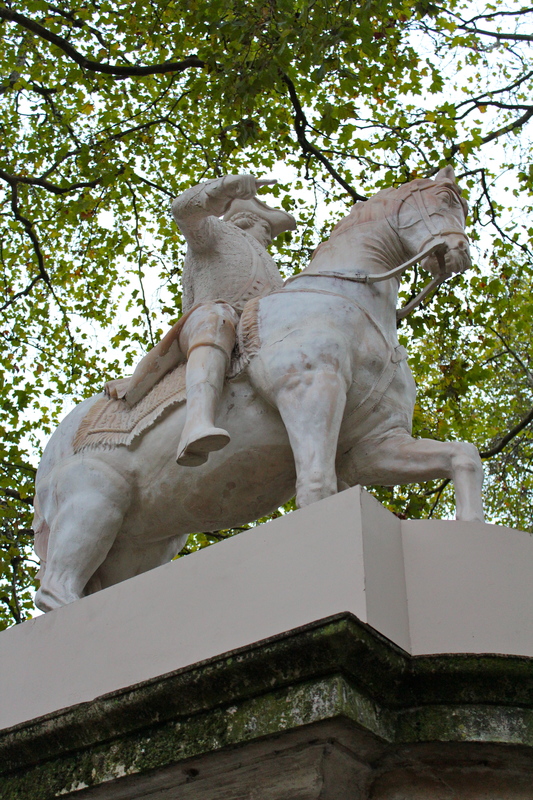 The piece was intended to be as close as possible to the original, based on existing sketches – although the exact dimensions remain unknown it was created to fit the proportions of the plinth. Intriguingly there are no signs in the square about its latest addition, so I can only guess that the casual visitor would assume it was an ordinary statue. Shin’s work has much to say about the changeable nature of art, monuments and history – she is particularly interested in the way that history is drawn (and re-drawn and erased) on the urban landscape. 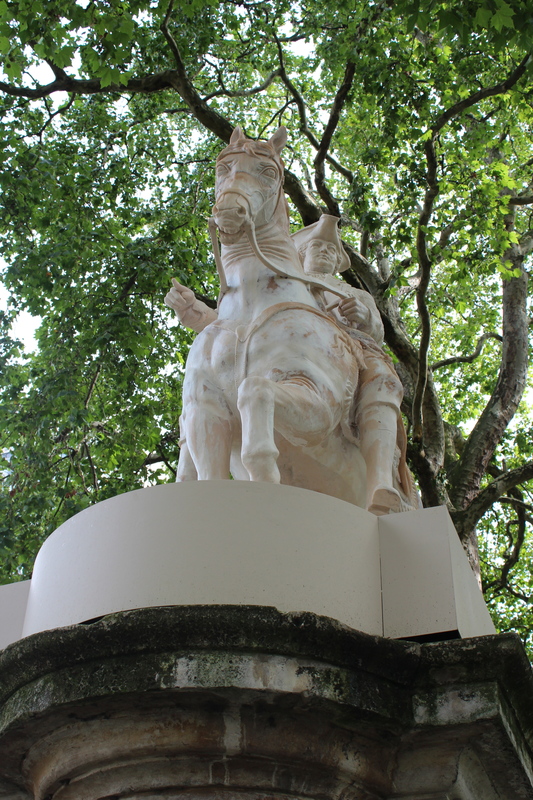 The sculpture will remain in Cavendish Square for one year – and it’s anyone’s guess how it will endure the four seasons. I plan to revisit it over this time and will update you on how it is progressing.